There is no inherent meaning to life. We decide what things mean or don’t mean. We are God in our world. We are born and raised with human trafficking of our spirit and soul as a cultural commodity, and we are simply short-lived biological anomalies bent on fulfilling cultural, religious or other man-made fantasies from this trafficking of our spirits. This process leaves me restless. I want to leave all the time, wherever I am, because it gives me the warm comforting feeling that I am actually going somewhere. If you are like me, nearer to the end of life than the beginning, you may see we made it this far to just find out we never really went anywhere in this vast universe. I used to think I had no grip on reality; now I think there was never anything to grip-onto except a few special people whose souls have spoken to mine. Yet, we are all someone’s sacrifice in this life never realizing that life can destroy us and them so gently that it is sometimes hard see or feel it happening. We are souls living in a meat covered skeleton trying to find our authentic self in a world dominated by mass media pulling us to be everything else but our authentic self. 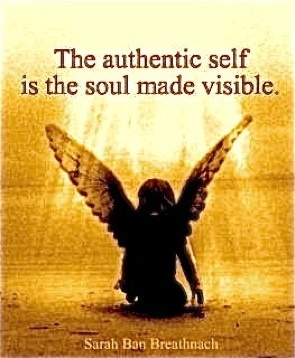 Still we search for our authentic self while every person who knows you has a different view of who you are in their heads than you have of yourself. It is no wonder there is conflict in the world. It leads one to believe that love in a connection with another soul is all that matters.